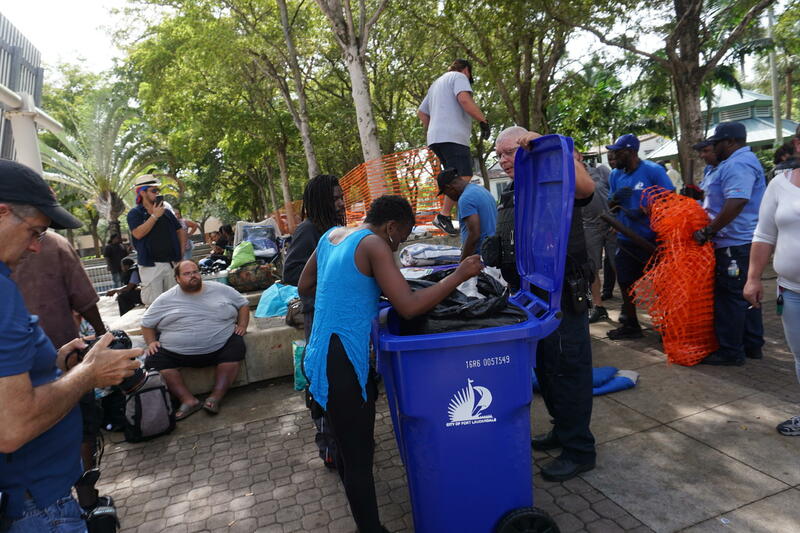 Fort Lauderdale workers throw away items from Stranahan Park. This raid has resulted in yet another lawsuit against the city based on policies and actions targeting the resident homeless community. Homeless living in Stranahan Park were told to put their belongings in blue bins to pick up later. Those who were not there or left belongings behind had their stuff thrown away. Before the sweep, an officer addressed those in the park, explaining that the city had to close the park because of concerns about a rat infestation. “It’s never meant to throw you out of here and arbitrarily kick you out. Unfortunately the park is going to be closed for at least 30 days to eradicate the problem,” said the officer, who was filmed by one of the homeless onlookers. The city was responding to a Notice of Violation from the Department of Health for the rodent problem. City workers gave everyone there a week-long voucher to stay in a motel. They could go wherever they wanted; they just couldn’t be in the park. 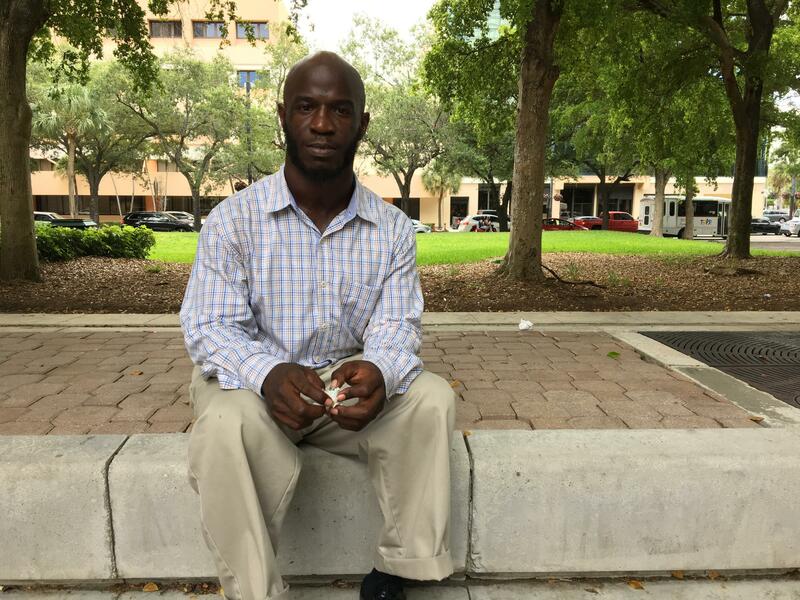 Eric Townsend lost all of his belongings when Fort Lauderdale workers cleaned out Stranahan Park. He is back at the park after staying in a motel for a week, paid for by the city. Everything was gone from the part of the sidewalk where Eric Townsend slept: ID, Social Security card, bedding, clothes and work boots. He wasn’t there when the city workers showed up to pack up his stuff, so it was treated like trash, thrown in the dump truck. Other people said they lost family photos, heirlooms, medications, and toiletries. “They don’t give a f---k about nobody out here. They just look down on us just because we [are] out here sleeping on the sidewalk,” adds Townsend. 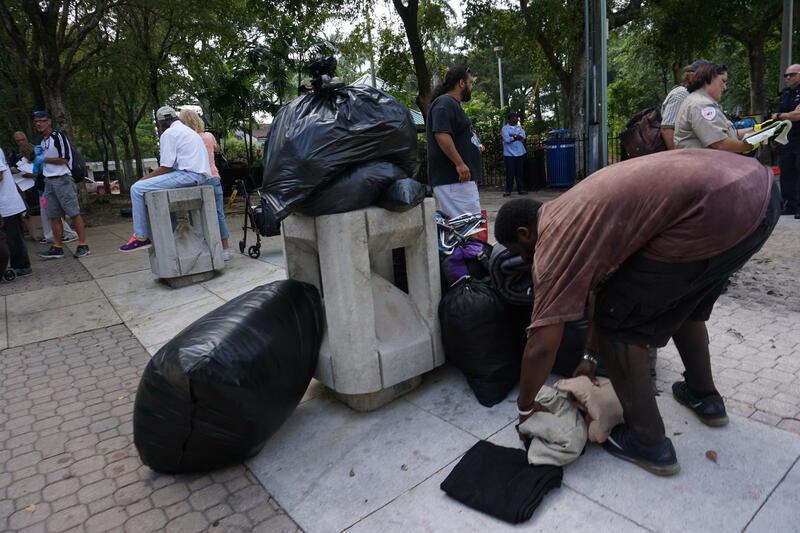 After news of the clear-out spread, Jackie Azis with the American Civil Liberties Union helped file a lawsuit on behalf of Townsend and the other people living in Stranahan Park whose belongings were thrown away. The suit alleges what Fort Lauderdale did violates Fourth Amendment protections against unlawful seizures and also violates due process as protected by the 14th Amendment. Signs erected around Stranahan Park. “Our plaintiffs are human beings, and just like anyone else wouldn't want the government coming into their home or interrupting a picnic that you're having at the park,” said Azis. She says even if someone is loitering and keeping things on public property the government can’t just take it and destroy it. “All our plaintiffs are asking is that the government not unlawfully seize their items and their prized possessions,” Azis adds. Fort Lauderdale has been in the spotlight over the years for how it deals with its homeless population, embarrassed on national television and in international headlines. In 2014, the city arrested a 90-year-old man for serving food to those living on the streets and cops were quoted as having said “drop that plate” before the man was fingerprinted, wearing his white chef’s coat. That landed the city on national television, in international headlines and on the late-night show "Colbert Report." A spokesperson for Fort Lauderdale declined an interview about this latest case. The city doesn’t comment on pending litigation, but in its response to the suit, the city alleges the homeless don’t have a right to store their personal property on public land. 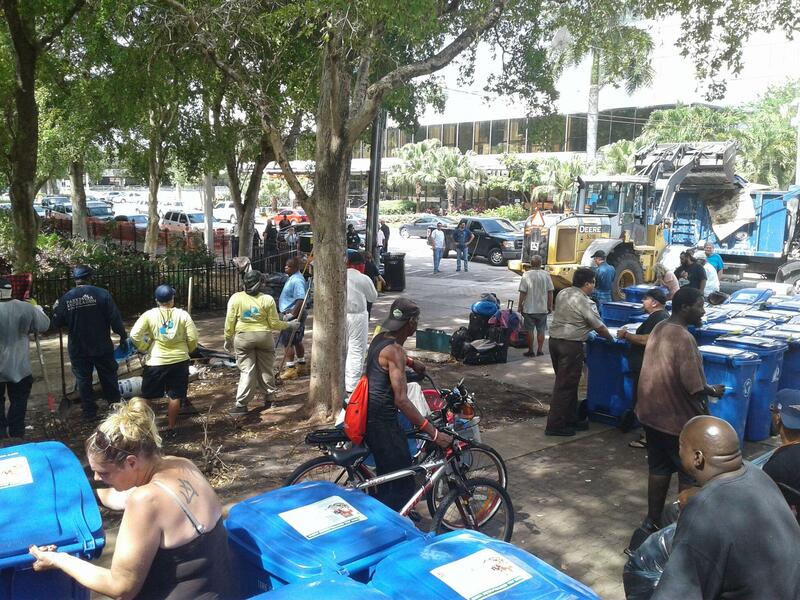 The scene at Stranahan Park when Fort Lauderdale workers cleaned out the park. The response adds that the city followed proper protocol in dealing with a health problem. It doesn’t need to give notice and it has the right to just go in and clean up an area. That’s what the two sides don’t agree on. What happened at Stranahan Park wasn’t about getting rid of the homeless. It was a very real sanitation issue. 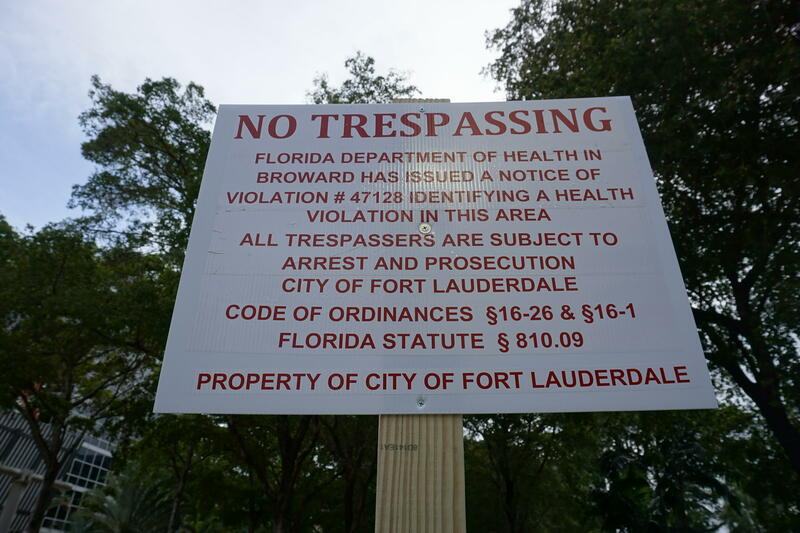 However, the city of Fort Lauderdale asked for that health code violation from state health officials. “My problem with the homeless is what we’re seeing right here out this window, that is, the negative visual impact of so many homeless in downtown. And we can address taking care of our homeless, which I consider a success. And I think we can address getting rid of the public feedings and the public residences here in this park and I would consider that a success,” Seiler said. Homeless advocates believe the health issue was a smokescreen. The scene from Stranahan Park the day of the clean up. There’s also been some internal questioning within the City Commission. During the June 6 meeting, Commissioner Dean Trantalis pressed the city manager, Lee Feldman, about what happened at Stranahan Park. Kirsten Anderson, attorney with the Southern Legal Counsel and the other lawyer representing the homeless at Stranahan, does not think the city’s actions were necessary. 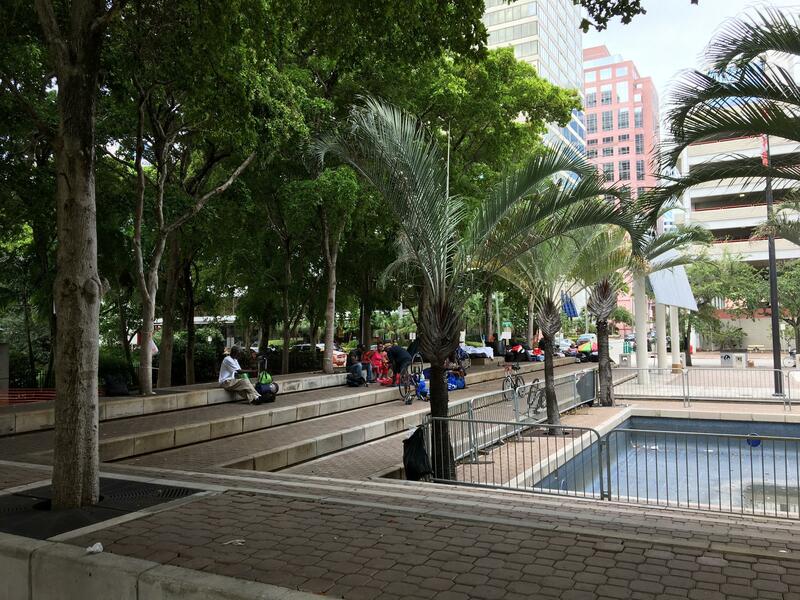 She says city responses like Fort Lauderdale’s are a misguided approach to reducing the visibility of homelessness that runs in the face of more effective methods for providing housing and services. In front of Stranahan Park a few weeks after the clean-out. Homeless people are back, camped out along the orange construction fence erected to keep them out. “If you aren't addressing the root causes, the only other choice you have is to pretend like it doesn't exist and you can only do that by trying to make it less visible." After the weeklong stay in the motel—paid for by the city—the homeless people started coming back. Now most of them have set up again at Stranahan Park, camped out along the orange construction fence erected to keep them out. Eric Townsend, one of the plaintiffs in the lawsuit against Fort Lauderdale got a job recently. He’ll be working for a phone-banking company. At night, he’s still sleeping in the park on spare cardboard he found and some new blankets he was given by local charities. Monday is the 25th anniversary of Fort Lauderdale’s Sun Trolley system, and the celebration promises to be a multi-sensory experience. The eye-catching red-and-yellow trolleys run on eight routes through Fort Lauderdale, taking riders to the beach, shopping and work. By the end of the month, they'll have a new app and website to make seeing routes and tracking transit easier.